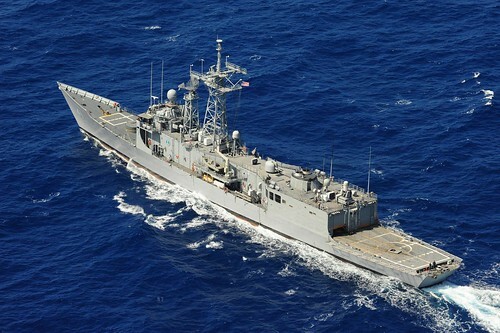 SAN DIEGO - The guided missile frigate USS McClusky (FFG 41) is scheduled to return from its final deployment to the 4th Fleet Area of Responsibility (AOR) to make preparations for decommissioning. SAN DIEGO - The Oliver Hazard Perry-class guided-missile frigate USS McClusky (FFG 41) is expected to depart San Diego for a scheduled deployment to the 4th Fleet area of operations. SAN DIEGO - The guided-missile frigate, USS McClusky (FFG 41) and guided-missile destroyer USS John Paul Jones (DDG 53) are scheduled to return to San Diego after independent deployments to two different areas of the world on two completely different missions. SAN DIEGO – The guided-missile frigate USS McClusky (FFG 41) is scheduled to depart San Diego Jan. 4 for an independent deployment to the Eastern Pacific Ocean. 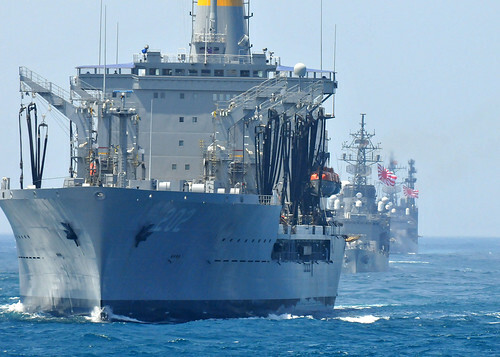 USS MCCLUSKY, At Sea - The guided-missile frigate USS McClusky (FFG 41) participated in a joint forces passing exercise (PASSEX) with the Japan Maritime Self-Defense Force (JMSDF). SAN DIEGO – Naval officers from eight partner countries were received aboard USS McClusky (FFG 41) May 19, during the 3rd annual International Frigate Working Group (IFWG).